THE PICKIEST EATER IN THE WORLD: A WEEKEND FIESTA AT MARCO POLO ORTIGAS' CUCINA! Here are some of the highlights, of what was a phenomenal meal! One of the three major highlights of the day was this massive Tuna, wherein guests may enjoy fresh slices of sustainable Tuna directly from the the fish itself. If that doesn't personify freshness, I don't know what will! There is also a nice selection of other sustainable seafood to choose from, such as prawns, mussels and oysters. You may choose your seafood and have it cooked to your liking! Love Sushi and Sashimi? Cucina has got your covered. You can't have a Pinoy Fiesta without a Lechon, right? Which is why Marco Polo's famous Cochinillo Fits right in! If that wasn't enough pork for you, they also had this phenomenal Crackling Pork Belly that no self-respecting carnivore could resist! And yet another highlight of the day was the slab Prime Rib, which was masterfully roasted and seasoned to perfection, not to mention lined with the perfect amount of fat! 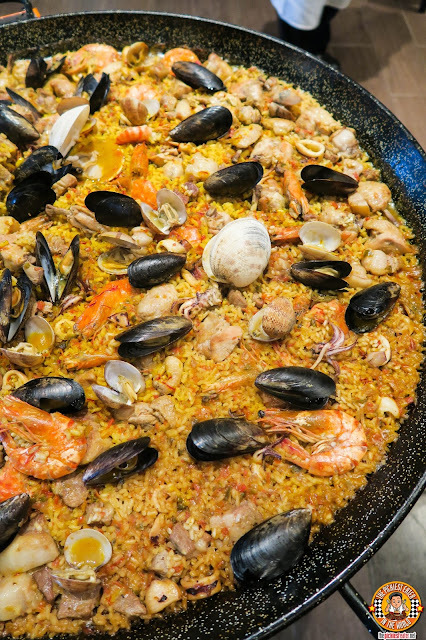 And of course, No trip to Cucina is ever complete, without sampling their Paella, which is cooked right in the open, letting you witness a masterpiece being created. Keeping with the Fiesta theme, Cucina had some Pinoy Favorites available, such as their delicious take on Sisig..
As well as Sinigang na Hipon, Kare-Kare, Adobo, and many more!! After all is said and done, you can enjoy their wonderful line up of cakes, pastries and even Ice Cream for Dessert, with my favorite being the White Chocolate Almond Cake. The Weekend Fiesta can be enjoyed from Fridays to Sundays at Php 2,300 net for lunch, and Php 2,650 net for dinner. For a limited period only, bring along two friends and enjoy this feast with one free buffet. Cucina is Marco Polo Ortigas Manila’s all-day dining restaurant and is open daily for lunch from 12:00 NN to 2:30 PM and dinner from 6:00 PM to 10:30 PM. Children aged 6 and below get to eat for free while children aged 7 to 12 years old are charged half the price. For more information contact (632) 720 7777 or email: restaurant.mnl@marcopolohotels.com. Visit facebook.com/MarcoPoloOrtigasManila or follow @MarcoPoloManila on Twitter or Instagram.